In the heady bouquet of Ba Than rice wine, a Phong Dien District specialty, Mr Hien, slightly tipsy, was holding forth on the ins and outs of the miracle, and the dozen or so listeners sitting around were very afraid. A few, who were still skeptical, were amazed at his storytelling skills and listening with their mouths open. The drum beats of the lion dance resounded loudly in a spacious ground under the large canopy of the gua trees. Incense smoke from the Ba Shrine spread over the large area in the April sun. Kids followed with great merriment the dance troupes converging at this mysterious spiritual place. There were so many people flocking to enjoy the event that it was easy to see a festival was being celebrated. "Listen, don't climb gua trees or break off any branch, or you'll be punished by Mother." His was deadly serious as he delivered the warning. "Who is that Mother, uncle?" one man asked. "I really don't know, but when I was small, these gua trees were already there and I heard the story about Thien Dong Co Hi who later we called Mother. On the 28th of every Lunar February, her death anniversary is commemorated." Uncle Sau also narrated another story, which was known to everyone. One day an excavator was working in the area on an irrigation project when it accidently broke a branch of the gua tree. That night, the machine's arm fell off suddenly, shocking everyone. When they heard about the incident, some old farmers advised the owner of the excavator to sacrifice a pair of ducks and worship Mother if they wanted to have peace. The stories about Mother had been passed through generations. A few hundred years ago, a number of relatives of the Nguyen Anh Lord settled down in the area and found a forest of lush green gua trees. They soon found out that if anyone chopped down or picked branches of the tree, they took ill and died soon afterwards. Since then, nobody dared to enter the forest and the trees grew very thick, creating a lot of eye-pleasing trusses and it was called "Gua Truss" then. One day, some farmers working in the field were smoking the "mo" cigarettes. Forgetting the Mother's wrath, they threw the cigarette ends into the forest, and it burned down. "What is the 'mo' cigarette? I haven't heard of it," a man asked. "It is kind of cigarette made of nux vomica leaves or young banana leaves and you can get stoned if you smoke it a lot. " A few days later, a lot of villagers died after contracting a strange disease. They could not touch food, but they vomited all the time, and suffered high temperatures and diarrhea till they died. A lot of people had left the place, except those from the Nguyen clan. A few months later there a white-haired Taoist hermit from Chau Doc passed by. He prescribed some traditional medicine to treat the ailing people and it had some encouraging effect. Before he left, he gathered the villagers and told them that the spirit of dead Mother Thien Dong Co Hi resided in the gua forest. She had gone into a rage because of the burnt forest, so "you should urgently rebuild the shrine to worship her." "Did the villagers do as they were told?" "They did, immediately, they were afraid of further punishment." Pausing in his story-telling, uncle Sau Hien closed his eyes tight and mumbled some chants for a few minutes and kept silence for quite some time. Some people remembered that when he was very small, he had often played marbles in the cool shade of the gua trees with his friends. Later, they would go swimming in the river. Once this was found out, his father had given him a good hiding. "Don't you have anywhere else to play? Do you know Mother will punish you if you disturb her? From now on, you're never to go to that place, you understand?" "Anyway, we did continue to go, because the place was too attractive. Now, at this old age, I cannot understand why that place had such a captivating power." Then, from 1965-1972, this area became a fierce war zone. The US and Sai Gon puppet troops staged a lot of mopping up operations. They fired shells days and nights into the gua forest. The villagers were very sad to see the forest being destroyed by the enemy bombs and shells. 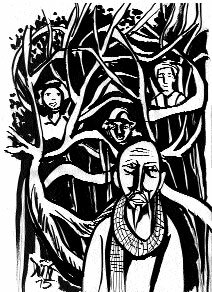 Uncle Sau and his friends would rush to the forest after each raid to see if the gua trees had survived. He suddenly stopped telling the story and stood up straight, looking at the gua trees as if he was seeking something mysterious there. Tears welled up and poured down his wizened face. He was remembering a time when enemy shells had rained down day and night. They were in their death-throes after the onslaught of wave after wave of liberation fighters advancing to liberate the South of Viet Nam. All the villagers were wide awake and watching the gua forest burn. His wife was there. "Some people and I are going to save the forest. You stay at home and take care of our children," she said, crying. "Oh, God, No! It's very dangerous. Stay at home now. I have to get these weapons ready for the liberation fighters. I beg Mother to bless our village!" "I've got to go even if I die. That forest is the blood and flesh, the priceless treasure of our village. Damn these enemy troops for destroying it. I'm going now. Do what I told you, my dear." She ran towards the gua forest and disappeared into the darkness. Now and then the forest flared up as the enemy shells landed. His wife did not return home. The next morning, the whole hamlet rushed to the forest and found the bodies of several guerillas tangled in the gua tree branches, including his wife. They still held buckets in their hands. A collective funeral was organized for them that day. "When you are not so busy, I would like to invite you to that funeral one day," Uncle Sau said. "Oh, I forgot I was telling you a hair-raising story. If anyone feels afraid now, you should go somewhere else. I am not responsible for anyone fainting now," he said, with a cunning smile on his face. "Come on! Tell it now! We can't wait!" "You know, any time the enemy launched a mopping-up operation in the forest, they all were killed there. And what's more, others could not find their bodies. Mother had plunged their bodies in the muddy river. Since then, they had no guts to enter the forest"
"Oh my God! That is scary. But is it true, uncle?" "It's true that they were killed there. Our guerillas had killed them. That their dead bodies had disappeared was something we came up with to scare them. But it worked like magic," uncle said, laughing. "I live alone. My children have got their own families." "It's my fate. On the other hand, I am still indebted to the gua forest, you see. My wife's soul is there, not to mention my comrades-in-arms. I live here so that I can tell anyone who comes here and wants to know the story about the forest, about Mother, about the enemy's destruction of the forest and about reclamation of the land for farming. The story is true. It does not have any superstition in it. After the liberation, the villagers have replanted the forest and regularly worshipped Mother at her shrine. Unfortunately, the forest land has shrunk now." Suddenly, his voice became weak. "What's the matter, uncle Sau? Why are you so sad?" "Why can't I be sad? My childhood has been closely bound to the gua trees. Now we've lost most of it, I feel guilty. Yet, it is being said that…." "It is said that the local administration is planning to turn this spiritual area into an ecotourism area. I am very worried about it." "Really! You should be happy! The land prices in this area will rocket thanks to that project"
"I know, but I am still worried. I don't know if all the memories about the gua forest will be kept or not. I am afraid that they will chop down all the trees without any regret." He fell silent. His old eyes looked out at the gua forest, an age-old witness to what was happening in and around it. In his mind, the images of guerillas appeared with satisfied smiles and his childhood hovered under the canopy of the gua trees.